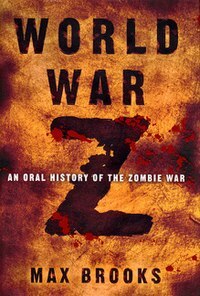 For this weeks From Page To Screen I have decided to cover World War Z by Max Brooks. Here's a bit of back story in case some of you aren't familiar with the novel. World War Z is a novel by Author Max Brooks. The book was originally published September 12, 2006 by Crown books. World War Z is a collection of individual accounts all over the globe that recount experiences and hardships faced during the Zombie war. Max Brooks himself is the interviewer working for the UN Postwar Commission ten years after the Zombie War started. World War Z released to most positive reviews and has sold over 1 million copies worldwide since release. Max Brooks- UN interviewer, Narrator and Author of World War Z. During the book Max Brooks travels around the world collecting data about the Zombie war. He is known for being brutally honest in his quest to find the truth. Todd Wainio- An Infantryman who details his movements through the Zombie war. General Travis D'Ambrosia- An officer during the zombie war, Travis recounts his experiences and mistakes during the Zombie war. Travis explains how the military had to rewrite the rules of war to deal with the zombie threat and how the administration at the start of the outbreak tied them up in so much red tape that they couldn't proceed against the threat even if they wanted to. In case some of you aren't familiar with the film, here is a bit of back story. World War Z is a film directed by Marc Forster and was released June 21, 2013 by Paramount pictures. World War Z cost $190 million to make and has so far earned over $423 million worldwide. 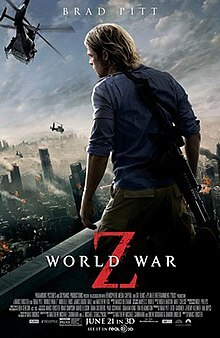 World War Z released to positive reviews and due to its success a sequel is planned. To save ammunition the military uses a device called the Lobo to smash the skulls of the zombies. This is omitted. In Yonkers, New York the Army engages in a huge battle trying to stop the hordes of undead. No battle of Yonkers takes place. All over the world convicted criminals are air dropped into zones filled with undead to try and give the citizens left a chance to escape. This is omitted. Many areas around the world aren't affected by the Zombie outbreak. The entire world falls prey to the Undead infection. The North Korean population moves into tunnels underground to avoid the zombies. The North Korean population has their teeth removed to avoid passing the infection to one another through bite wounds. Patient Zero originated in China. It is suspected North Korea is where the infection originates from but ultimately they learn it was India. The Narrator is the Author of the book Max Brooks. The Narrator is a character called Gerry Lane. Several countries are responsible for helping in the war against the undead. American ingenuity saves the day. The Zombies move very slowly. The Zombies can run and jump. The UN mounts a major campaign to kill the Zombies that have migrated into the ocean. This is omitted. Even though millions of zombies are left in the world technically the war has been ended by the time the book starts. The Zombie war is just beginning. Iceland is completely gone all known inhabitants have been turned into Zombies. This is omitted. These are the biggest changes I noticed when the book was taken From Page To Screen. Which however do I prefer? I said this yesterday when I reviewed the film and I'll say it again today, I actually liked the film more than the book. I really liked Brad Pitt's character and the film just flowed really well. I never found myself bored and I just can't say the same about the book. So this week the film is the clear winner. However, I do suggest reading the book through at least once. However, don't dismiss the film just because it doesn't follow the book exactly. I think since this is the first in a planned series we may see more from the book as the series goes on. It just wasn't dumped on the viewer all at once in the first film. _____________________________________________ Well that about wraps up this weeks From Page To Screen. Have a recommendation for an upcoming From Page To Screen, let me know in the comments below! What is your favorite quote or scene from World War Z? Just for fun: The first item you see to your left is your zombie weapon. What is it? I read the book several years ago and liked it but I prefer Max Brooks Zombie Survival Guide to this novel. The movie is a real loose adaptation but I think since its only the first film we might see more of the books content in the future. Looks like a lot of "This was omitted," from the movie adaptation. I've heard that since a sequel is in the works, more of the book might actually appear in it. Still wondering if I should even bother with the book. Either way, it's not high on my priority list at the moment, based on what I've heard. I think if you do want to read the book definitely go for the Audio version.